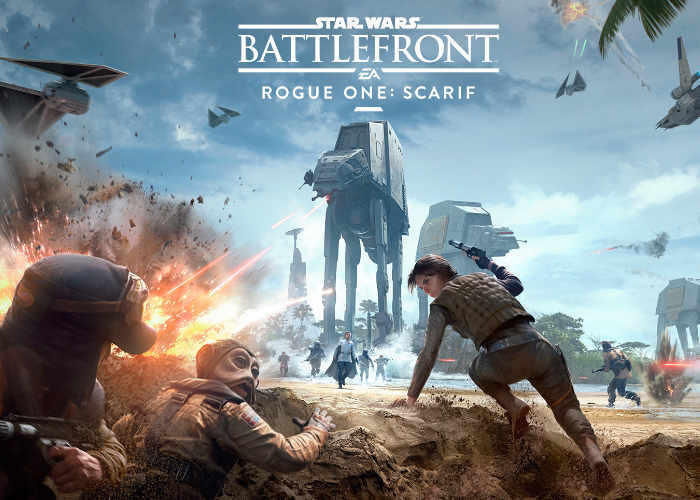 To celebrate the one-year anniversary of the launch of the hugely popular Star Wars Battlefront game, EA has today released more details about the upcoming Rogue One Scarif DLC expansion together with announcing the X-Wing VR mission, created specifically for the PlayStation VR. It’s been an incredible year for Star Wars Battlefront. The game has evolved in ways we never thought possible, and the community has exceeded our wildest dreams with their creativity and passion. From cinematic still frames to hilarious comedy shorts, there’s no limit to the creativity of the Star Wars fan base, and we’ve had a blast looking at all of the content created over the last year with Battlefront. But before we take a look back to celebrate, we want to quickly take you forward with some exciting news about something we’ve been working on for a while now. We’re happy to finally announce new details on Star Wars Battlefront Rogue One: Scarif, which arrives for all Season Pass owners on December 6. The fourth and final digital expansion pack gives you access to new content inspired by the upcoming film Rogue One: A Star Wars™ Story, arriving in theaters on December 16. In Rogue One: Scarif you’ll battle across four new maps, including the sandy beaches of Scarif – an all-new tropical planet crawling with Imperials – which should look mighty familiar to anyone who saw the movie trailer. Know that incredible scene in the trailer where the AT-ACT is marching through the waves? That’s the one! Joining the battle are two new playable heroes: Jyn Erso and Orson Krennic, as well as a new multi-stage game mode with space and ground combat. Take your first look at the artwork for the upcoming expansion pack above, and get ready for an epic Star Wars adventure on December 6 in anticipation of the new film.